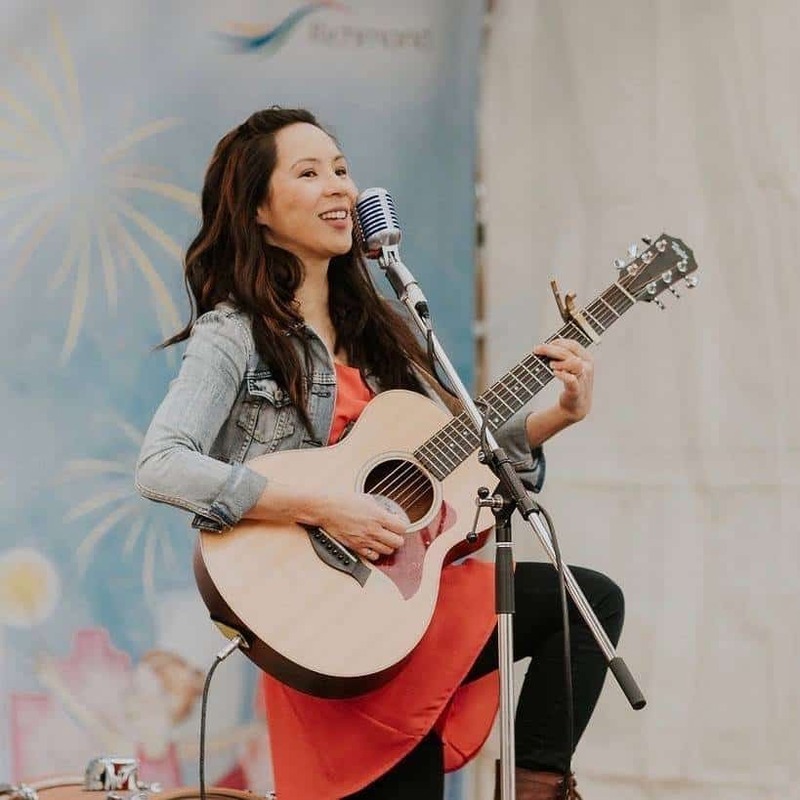 West Coast singer-songwriter Ginalina (Gina Lam) makes folk music that drives kids of all ages to get up and DANCE. 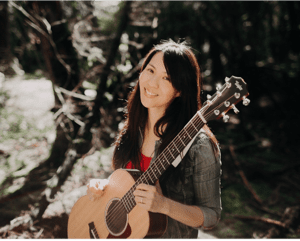 Ginalina has clinched the title of Best Children’s Artist (Western Canadian Music Awards), two Canadian Folk Music Award nominations, and three Parent Choice Awards. She was also nominated for a 2019 JUNO award for her children’s album, It Takes a Village. We caught up with her this week. SDTC: When and where do you feel most content/at ease? GL: Nothing beats a warm house filled with noisy kids. It’s busy, but I’m reminded that they’re more than worth my time and attention. What was your reaction to being nominated for a JUNO this year? When I was nominated three years ago, I was so startled that I knocked over a crate of oranges! When I heard the news this year, I was, again, surprised and thrilled! My original music vision was to create one album for each child, themed on something meaningful in our lives. It Takes a Village was the last one in that set, so I was in a good place without expectation for more. That being said…a JUNO nomination!? I couldn’t be more grateful! Who or what has had the greatest influence on your songwriting/music? A few things stand out in my singer-songwriter journey. Cat Stevens’ Tea for the Tillerman was the first album I owned. I loved his vulnerable voice and pointed storytelling on that album. I also have great memories of live bluegrass and upbeat folk bands at the Silver Dollar and Free Times Cafe, so I try to bring in that energy into my work through fiddle, banjo, accordion, and more. I write about people and places and ordinary life, which greatly include the wonders of childhood, nature, family, and community. What food/dish always satisfies you? What film/show has recently wowed you? I recently saw the film Leave No Trace by Debra Granik. It’s about a father and daughter living outside the norms of society. I was really taken in by the beauty in their ordinary moments—cooking, eating, walking through nature, playing a game of chess, making new friends. It was also a moving story that touches on choices and sacrifices we make in life. I’d recommend it. What’s on your current reading list? Children’s classics. We always have a few on the go in my house. Endurance, about Ernest Shackleton’s failed Antarctic voyage. Beyond Soap by Dr. Sandy Skotnicki, a Toronto-based dermatologist who uncovers some of the truths (and lies) about the skin and what we need to take care of it. You’ll never look at your skincare products the same afterwards! What Toronto spaces/places do you truly love? I love the red TTC streetcars that take me where I want to go. I also have fond memories of downtown Chinatown and Kensington Market. The smells, tastes, and colours amid the hustle and bustle is nostalgic. What exhibit/museum are you dying to see? A few days ago, I found a dusty book about the Museum of Modern Art in New York. I’d enjoy a trip there. I like seeing the world through other people’s perspectives. At the moment, it’s the gym. There’s an especially gritty one that I like that’s full of good-hearted people, loud music, and the sweet aroma of sweat! What five things would you want if you were deserted on an island? A wool sweater and my boots. What’s a childhood memory that always brings a smile to your face? My dad took very good care of his plants and I liked to help him water them. What life philosophy is currently helping to guide your journey? Be thankful. Take care of what we have and always be ready for change. One skill you’d love to learn/nurture/improve this year? I want to master making a few great dishes. There are a lot of mouths to feed at my house, and it would be nice to create some strong memories of family rooted in the delicious nourishment of food. What’s a piece of career advice that has served you well? Find something that sparks your joy, and you’ll never have to “work” a day in your life! What outfit makes you feel the most you? Denim jeans, denim jackets. Plus, I like to mix up trendy basics with colourful pre-loved treasures found in second-hand shops. What toy/book have you held onto since you were small? I don’t think I have any toys or books, but I have some black and white photos of my parents framed on a window sill. What’s a subject that is currently holding your attention? An issue that you’re focused on? When you compare yourself now to where you were at ten years ago, what’s a major change you can identify? 10 years ago, I left a job to become a relatively new wife, and a new parent, in a new city! It was daunting, exciting, and wonderful. Now, my husband and I have four children (ages 10, 8, 6, and 5) and have a network of good friends and family. I make music, raise kids, and things are still daunting, exciting, and wonderful! Life as a musician, mom, and more is full, and rewarding. My goal is to be content, keep growing as a person, parent, and singer-songwriter, and to make more time to be with the people that I love.